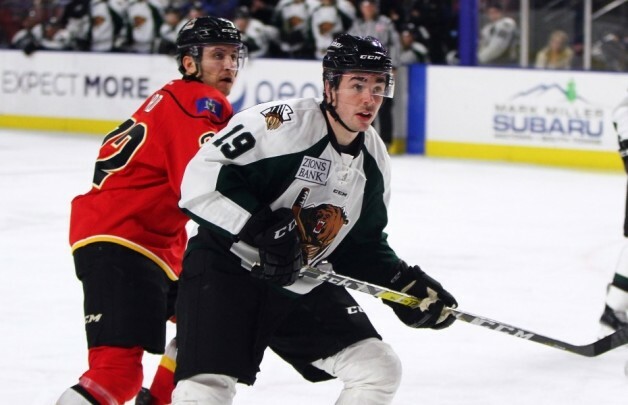 The ECHL announced Jan. 3 that Utah Grizzlies forward Erik Bradford will represent the team at the 2017 CCM/ECHL All-Star Classic, presented by I LOVE NY. The game will air live exclusively on NHL Network on Wednesday, Jan. 18, at 6 p.m. Mountain Time from the Glens Falls Civic Center in Glens Falls, N.Y.
Bradford has three goals and 17 assists for 20 points in 19 games since being acquired from Toledo on Nov. 14. He is the Grizzlies leading scorer since joining the team. Bradford had eight assists in four games on the team’s just completed 3-1 road trip, including a four-assist game in Utah’s 5-3 win over Missouri on Wednesday. The 2017 CCM/ECHL All-Star Classic presented by I LOVE NY will feature the host Adirondack Thunder taking on the ECHL All-Stars in a non-traditional format featuring 5-on-5, 4-on-4 and 3-on-3 play, as well as a Skills Competition (Puck Relay, Hardest Shot, Fastest Skater) to highlight the talents of both teams.